Full page, full color. 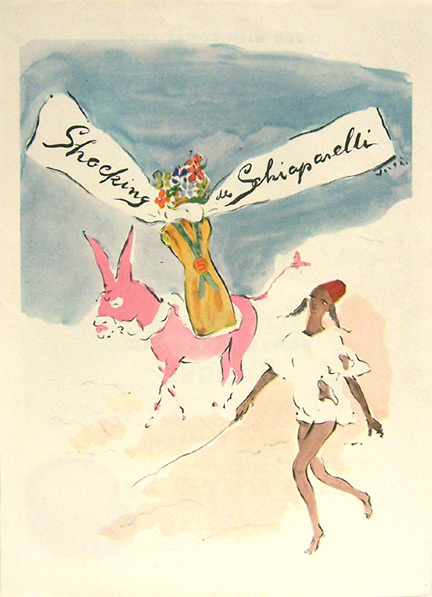 Great fictitious conversation between Schiaparelli and Stalin. This editorial feature is very rare due to the age of the publication in which it appeared. It was published only once. Condition: No tears or creases, sooty spotting at top edge, staining along top, side and bottom edges. 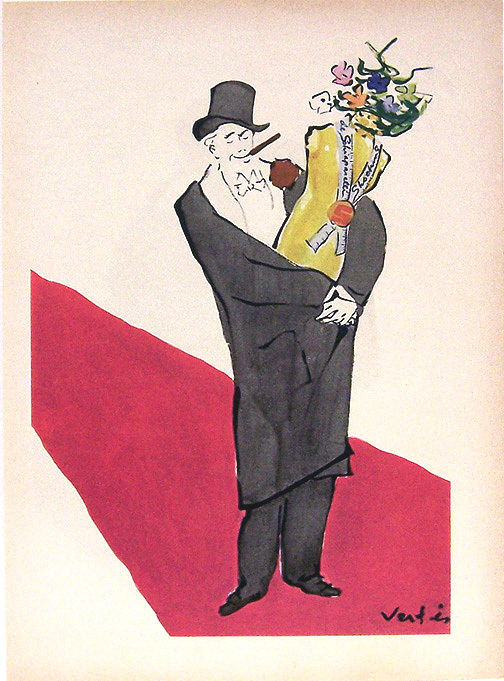 Publication: Vogue, June 15, 1936. Page Size: 9" x 11"
Full page, full color. 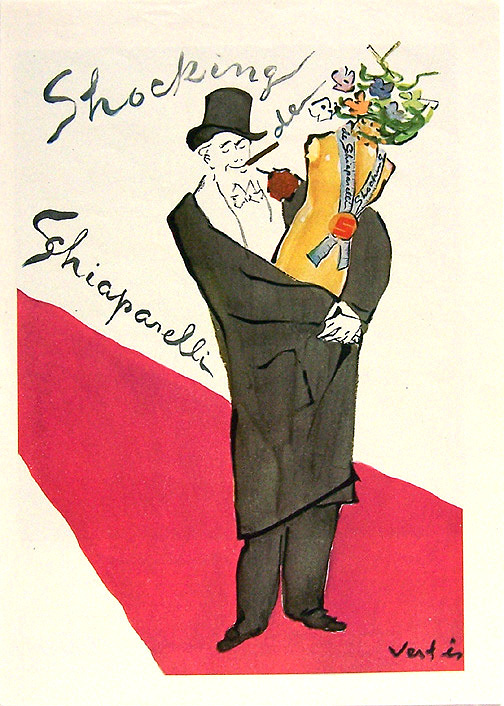 Rare ad for a rare bottle made by Baccarat. Condition: No tears, stains or creases, tiny spot of printing ink on right edge, slight age darkening on edges. 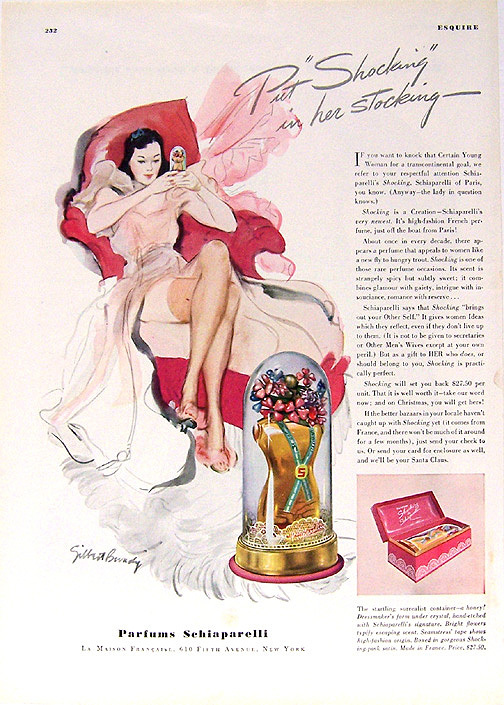 Publication: Vogue, March 15, 1947. Page Size: 9 1/4" x 12 1/8" (entire page, including binding staple holes). Back-to-back ads. Full page, full color. Condition: Dana - no stains, creases or folded corners, 3/16" tear at top corner, 3/16" tear at outer edge, thin paper on left edge around tear (looks soiled), bleed-through of printing from Schiap ad. 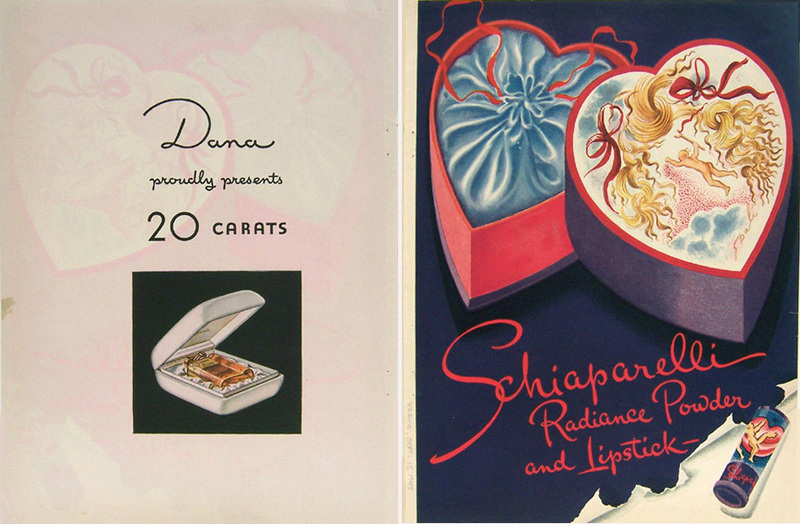 Schiap - same as Dana ad, no visible bleed-through, thin paper on reverse side not visible on Schiap ad. 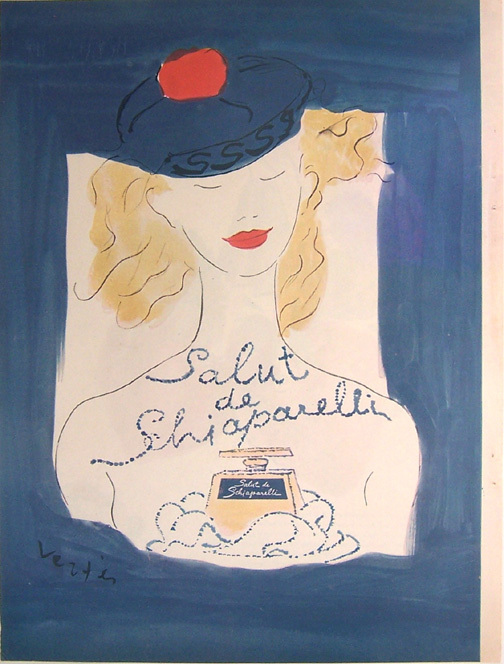 Publication: Vogue, September 15, 1945. Page Size: 9 1/8" x 12 1/8" (entire page, including binding staple holes). Condition: 3/16" tear on left edge; 1/4" tear on left bottom edge; no creases, stains or folded corners. Nice clean ad. Page Size: 8 1/4" x 11 1/4" (entire page, including binding staple holes). Full page, full color, bleed, with gutter (binding edge). Condition: No creases, stains or folded corners; small crimp upper left corner. 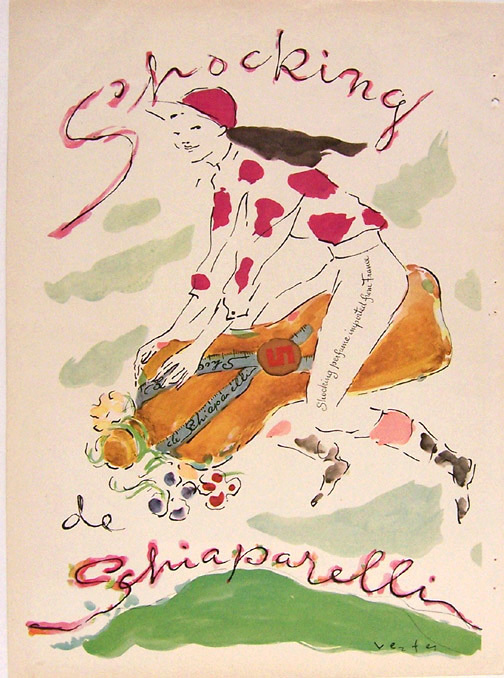 Publication: Vogue, April 15, 1946. Page Size: 9 1/4" x 12 1/4" (entire page, including binding staple holes). Condition: No tears, stain near left edge, light crimping top and bottom edges, irregular cut left edge. Note: Please be sure to read "Our Policies & How to Buy" regarding New Yorker magazines. 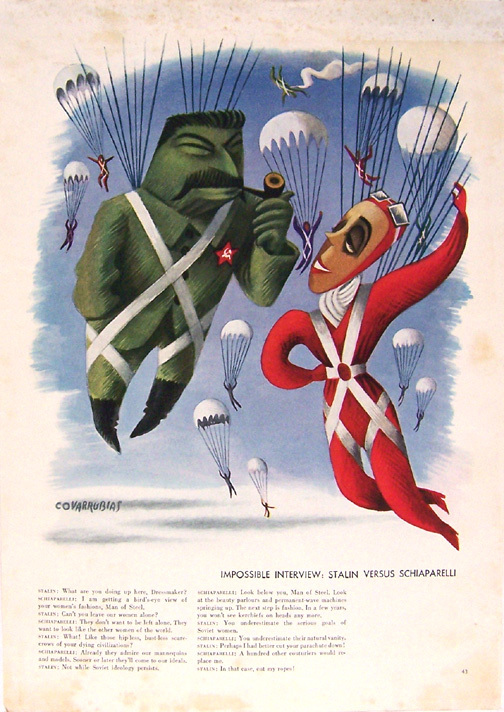 Publication: New Yorker, June 12,1943. Page Size: 8" x 11 1/8"
Condition: No tears or stains, light crimping on left center and bottom edges, all-over age discoloration. Page Size: 9 1/4" x 12 5/8"
Back-to-back ads. Full page, black and white. 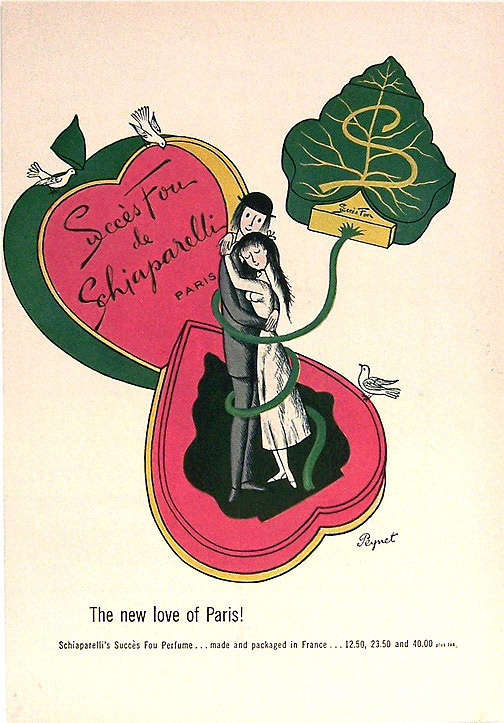 Schiaparelli ad -- this is one of the earliest ads for Shocking perfume, and one of the rarest. Condition: No stains or folded corners, 1/4" tear top corner. Rigaud - pencil-written documentation lower right in white area. 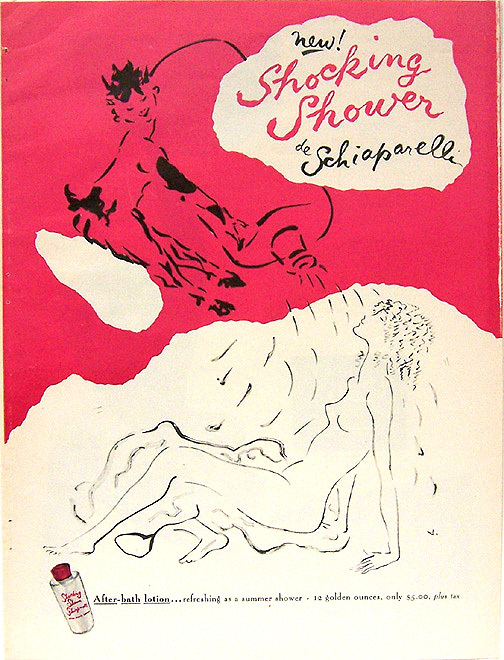 Schiap - shows some rubbing in black area at top, ink transfer from adjacent page. Overall, a clean ad in excellent condition for its age. 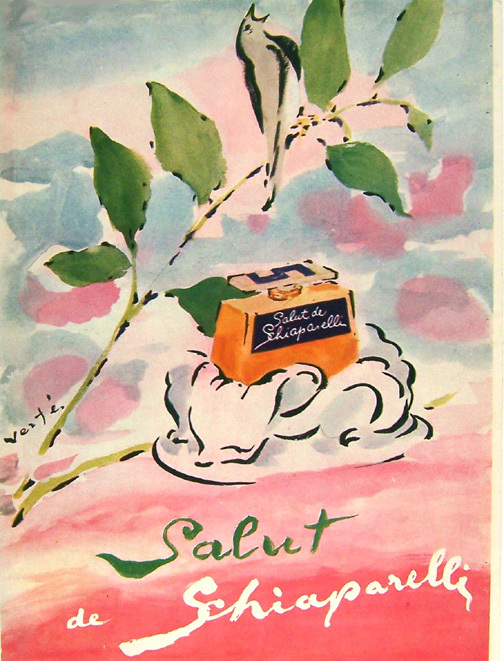 Publication: Plaisir de France 1937. Page Size: 9 3/8" x 12 3/8"
Condition: No stains, tears or folded corners. Photo of ad is darker at top than it actually is. Page Size: 9 3/8" x 12 7/8"
Condition: No tears, crimps upper left corner, rippling upper right corner, double fold upper right corner, fold lower right corner, stains on lower edge, light center crease (common on New Yorker ads). Publication: New Yorker, November 17, 1943. Condition: No stains, tears or folded corners; double crimp upper left corner. Nice clean ad. Page Size: 9" x 12 1/4" (entire page, including binding staple holes). Condition: No tears, stains or folded corners, slightly irregular cut left edge. Nice clean ad. Page Size: 8" x 11 1/4"
Condition: Lelong - no stains or folded corners; tears, 3/8" and 5/8" on bottom edge, 3/8" and 3/4" on binding edge, crimps bottom edge; pencil-written documentation at bottom edge. 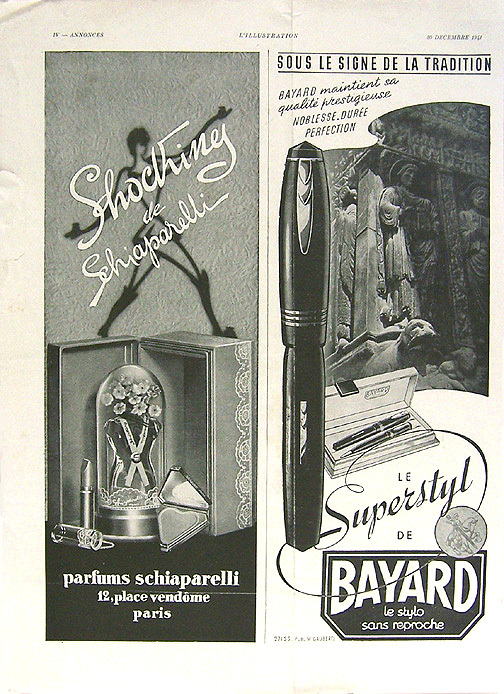 Schiap - same as Lelong ad, no pencil notation at bottom. Overall - a clean ad. 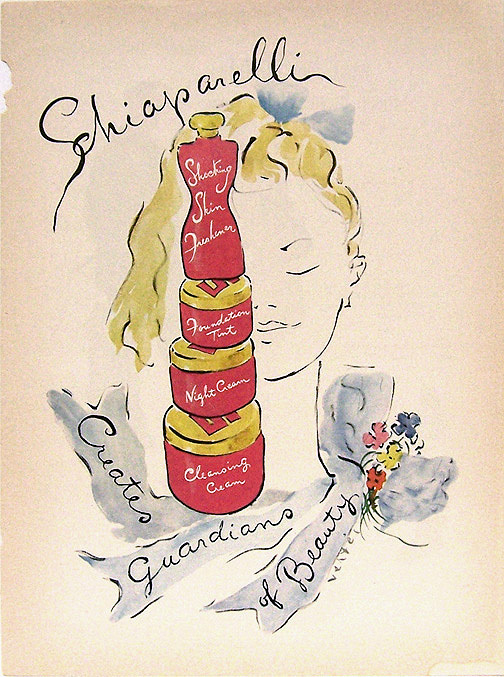 Publication: Bazaar, December 4, 1952. Half page, reverse black and white. Condition: No tears or folded corners. Moisture stain top left edge, nibble center left edge, vertical center crease -- none affect the ad. 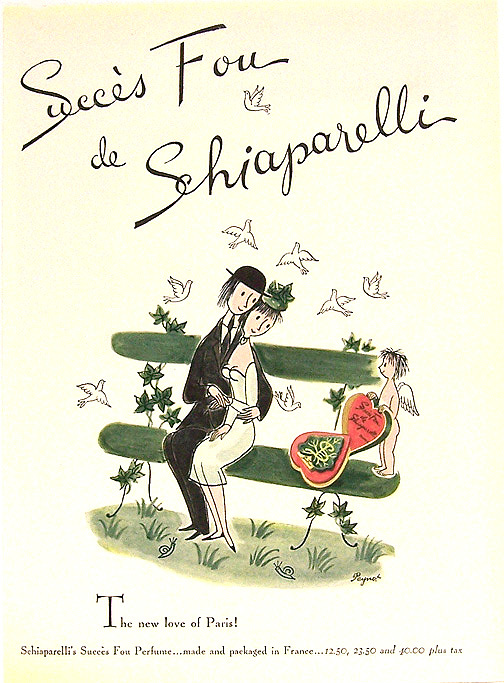 Publication: Harper's Bazaar, March 1958. Page Size: 9 1/8" x 12 3/4"
Condition: No stains or folded corners, 1/2" tear on left edge, cut close on right edge -- does not affect graphics. Nice clean ad. Page Size: 9" x 12 1/2"
Condition: No stains, tears or folded corners. The ad appears very dark on the top and left side -- sorry -- not a good photo. This is a nice clean ad. Page Size: 8 1/2" x 11 3/8" (entire page, including binding staple holes). Condition: 3/8" tear below lower staple hole; very faint moisture stain approximately 3" in on left side, (slightly darker on upper right corner and lower right corners); large horizontal center crimp. Page Size: 9 1/8" x 12 3/4" (entire page, including binding staple holes). Condition: No tears or stains, very light moisture mark top right corner (not noticeable), very slight foxing (age discoloration) lower right edge. Ad appears darker at top and left edge than it really is. Nice ad. Page Size: 8 1/4" x 11 5/8"
Full page, 2-colors (black and yellow). Condition: No stains, tears or folded corners, light moisture smudge at bottom near right corner, all-over foxing (age discoloration) with darker edges. Publication: New Yorker, December 15, 1951. Condition: No tears, stains or folded corners, light foxing (age discoloration) on edges, very light crimping lower right corner. Nice ad. 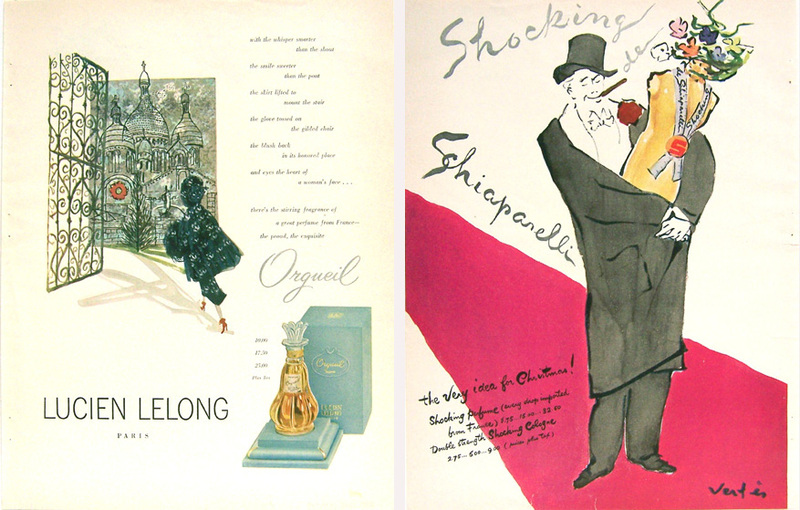 Publication: Vogue, June 1, 1947 (entire page, including binding staple holes). Page Size: 9 1/4" x 12 1/4"
Condition: No stains, tears, creases or folded corners. Nice clean ad. Publication: New Yorker, April 10, 1954. Page Size: 7 7/8" x 10 3/4"
2/3 page, black and white. Condition: No stains or folded corners, 3/16" tear at bottom edge, all-over foxing (age discoloration) with darker edges. Publication: New Yorker, November 2, 1957. Page Size: 8 1/4" x 11 1/2"
Condition: No stains or folded corners, 3/16" tear near bottom right edge, slight all-over foxing (age discoloration) with slightly darker edges. Nice condition for its age. This particular ad is especially difficult to find without some foxing. Page Size: 7 5/8" x 11 3/8"
Condition: No stains or tears, visible center crease, light fold lower right corner with small moisture mark, very faint ink transfer from adjacent page on right edge and lower left corner, left edge cut extremely close to graphics -- but does not cut into it. Photo makes the ad appear darker at the top than it actually is. Page Size: 7 3/4" x 11 1/4"
Half page, black and white. Condition: 1/2" tear and 5/8" tear on left edge, vertical center crease (tears and crease do not affect graphics), horizontal crease near bottom can be seen in black area. Page Size: 10 3/4" x 14 7/8"
Full page, 2 colors, black and hot pink, bleed. Condition: No tears or stains, crimp upper left corner. Printing defect -- 1/16" of pink ink missing on right edge. A nice clean ad. Page Size: 9 5/8" x 12 3/4" (entire page, including binding staple holes). Full page, full color, bleed. 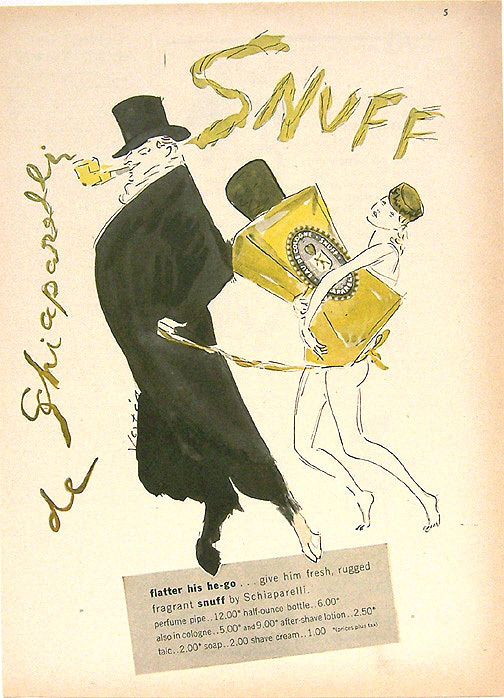 This is one of the oldest American ads for Shocking perfume and one of the rarest. 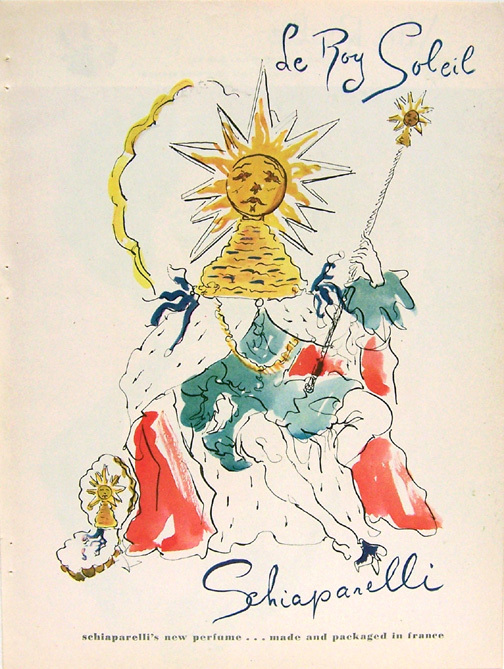 The artwork is not signed, but it might be the work of Salvador Dali. Condition: No stains or folded corners, 1 1/2" tear on left edge (taped on reverse side -- no bleed-through from tape). A great, clean ad. 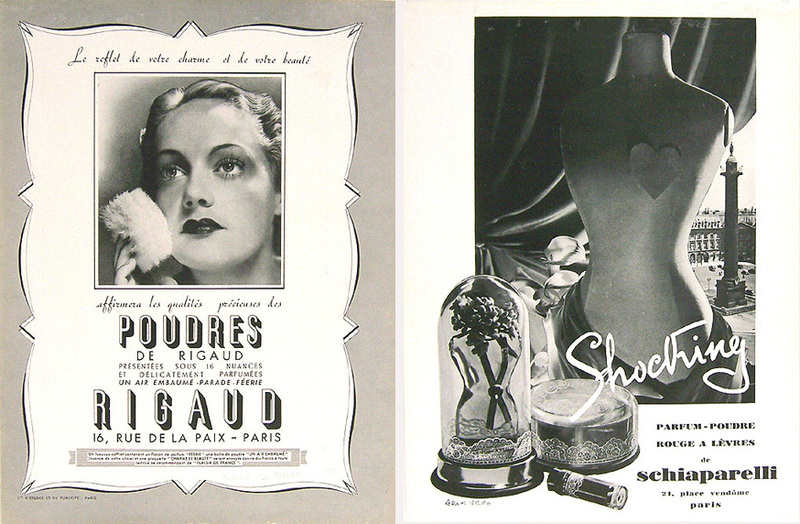 Publication: Vogue, November 15, 1938. Full page, full color. 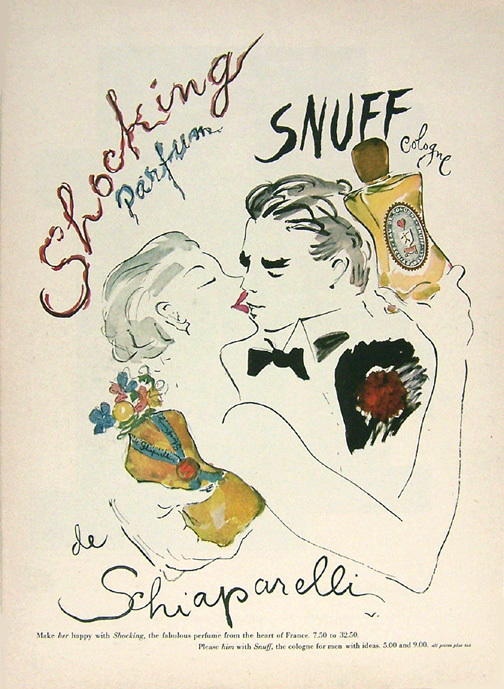 This is one of the oldest American ads for Shocking perfume and one of the rarest. 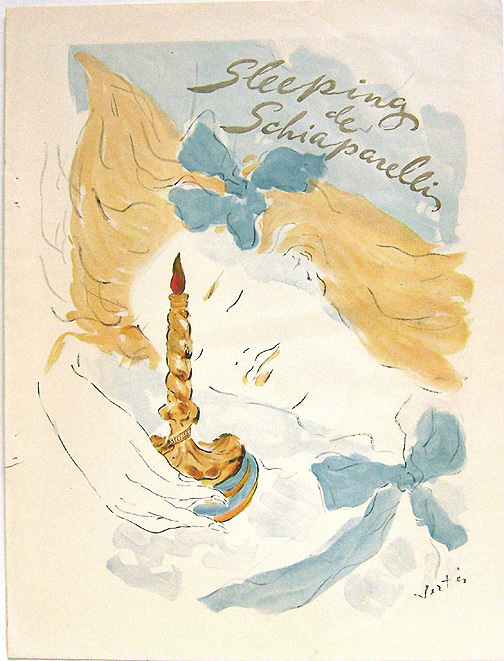 Condition: No tears or folded corners, small stain above the word "Schiaparelli," tiny stain next to photo on right, small spot of glue residue (from binding) on right edge. A great ad -- in great condition for its age. Page Size: 10" x 13 7/8" (entire page -- no staple holes -- glue was used in binding). Full page, full color. There are 8 versions of this ad. This is one of the two earliest versions. All versions have the same graphics but with various type-set and artwork text. You will notice there is no text in the background of this ad. 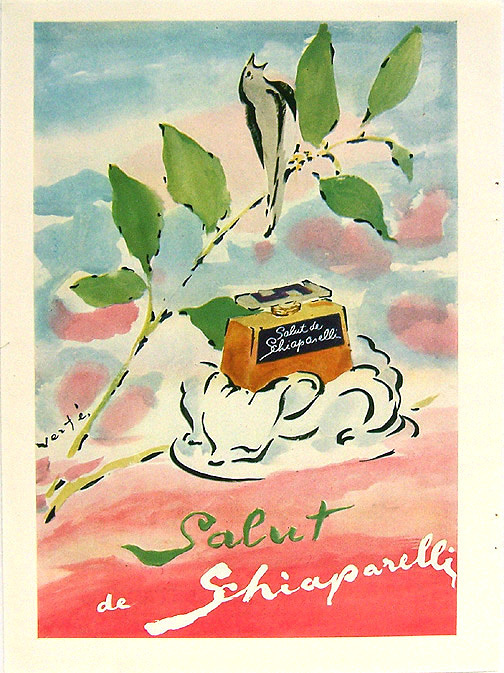 There are only 3 words -- "Schiaparelli" -- "Shocking" on the tape measure, and "Vertes" (the artist's signature). Clever design forces you to read the words written on the bottle. Condition: No tears, stains or folded corners, light foxing on all sides. Photo of ad is much darker than it actually is. Nice ad -- excellent condition for its age. Note: Please be sure to read "Our Policies & How to Buy" regarding New Yorker magazines. Publication: New Yorker, January 26, 1946. Page Size: 8 3/8" x 11 3/8"
Condition: No tears or folded corners; missing paper top left edge; very, very, light center crease; moisture stain bottom right corner; over-all foxing (age discoloration) with darker edges. Photo of ad is darker at top, and lighter at bottom, than it actually is. Page Size: 8 1/2" x 11 1/2" (entire page, no visible staple holes). Rubinstein - 3 colors: black, blue and red. Features 9 gift items, including the "Christmas Angel -- Slumber Song Night Perfume" for $5. !! 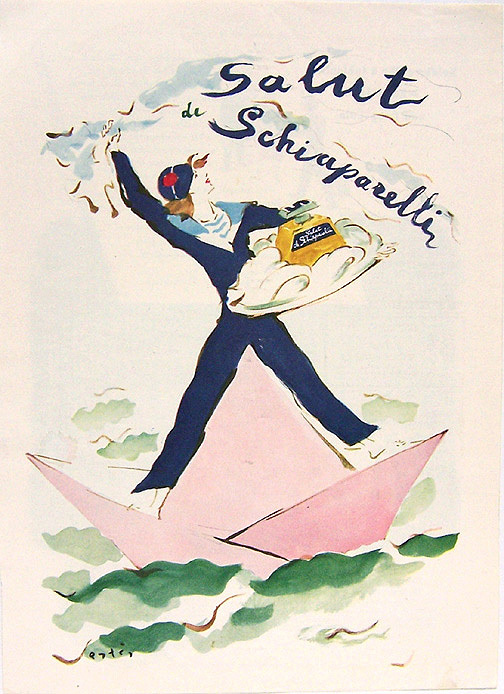 Schiaparelli - full color. 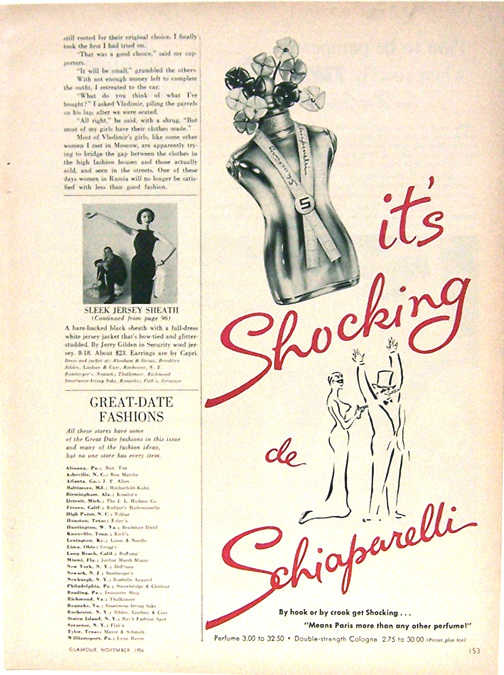 This is one of the earlier American ads for Shocking, and a hard one to find due to the age of the publication in which it appeared. Condition: Rubinstein - no tears, stains or folded corners, minor moisture mark lower right corner, pencil notation bottom right edge. 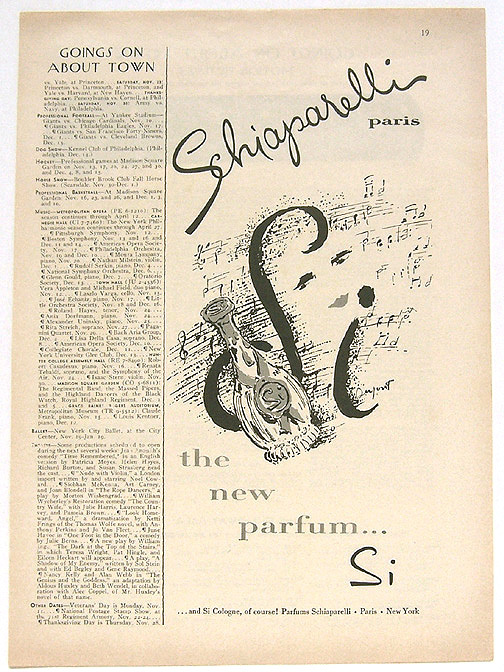 Schiap - same as Rubinstein ad, no moisture marks, no pencil notation at bottom. Both - nice ads. 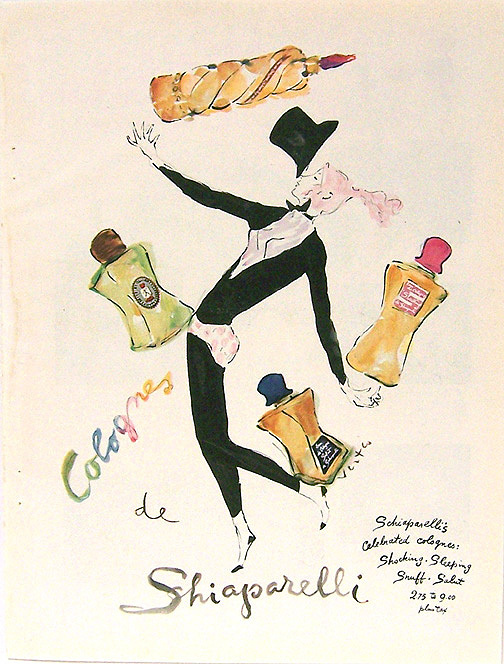 Publication: Harper's Bazaar, December 1939. Page Size: 9 1/8" x 12 1/8"
Full page, 2 colors: black and red. A very striking ad. Condition: No tears, stains or folded corners, all-over light foxing (age discoloration) with darker edges. Photo of ad is darker at top than it actually is. 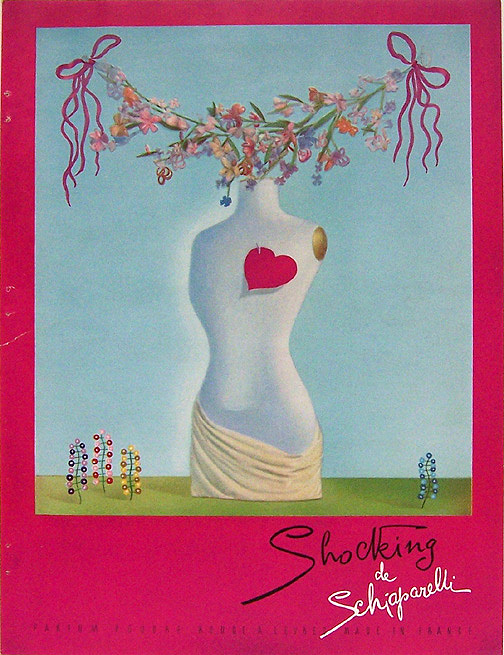 Publication: Vogue, April 1, 1948. Page Size: 9 3/4" x 12 3/4" (entire page, including binding staple holes). Full page, full color, bleed. Condition: No stains, 1/8 tear on gutter (white) edge, crimp top left corner, tiny, tiny crimp bottom left corner. 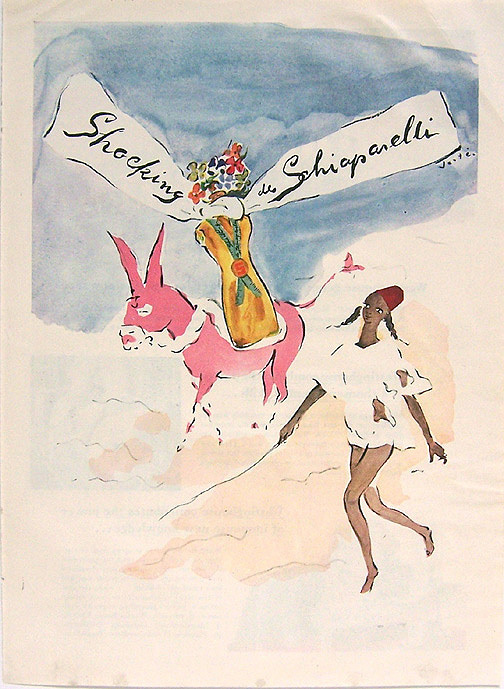 (1) Side 1 -- Schiaparelli, editorial feature, 8 Shocking products. 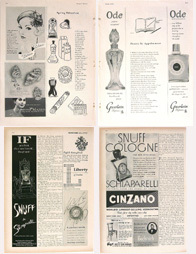 Side 2 -- Guerlain, 2 ads on the same page -- Ode perfume, Ode cologne. 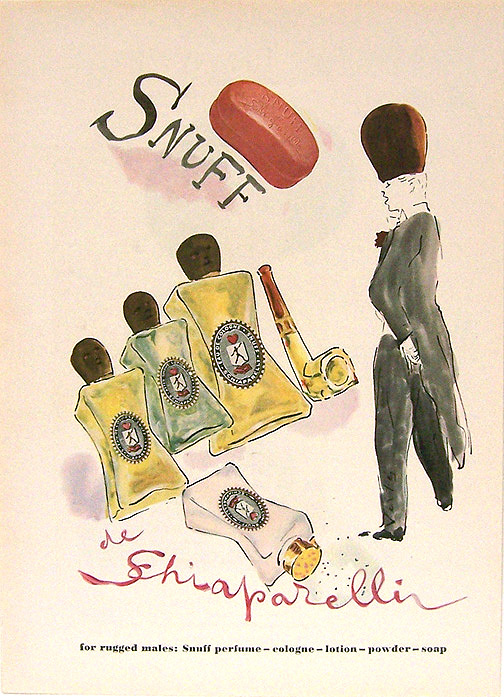 (2) Schiaparelli -- Snuff toiletries for men. 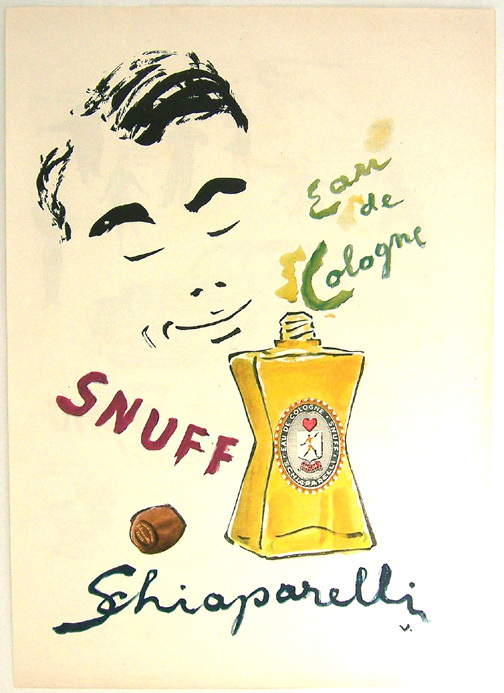 (3) Schiaparelli -- Snuff Cologne. 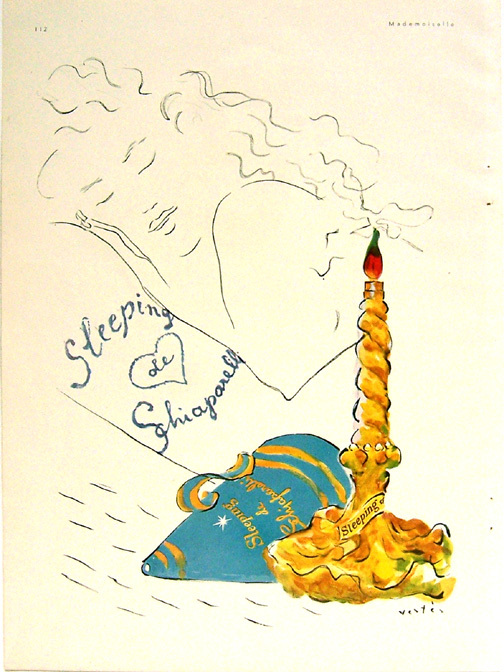 The artwork for (1) is signed under item #8 "Worhol" and, again, on the reverse side under the illustration for the editorial between the two Ode ads. 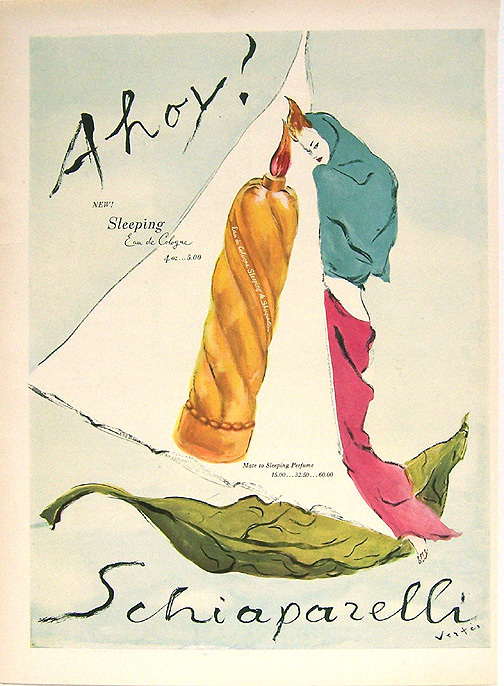 Andy Worhol worked for Bazaar magazine from 1951-1964. Condition: Photos of ads are darker at top than they actually are. (1) Side 1 -- Schiap, no tears, stains or folded corners, rust marks around staple holes. Side 2 -- Guerlain, same condition as Schiap. (2) Schiap, no tears, stains or folded corners, allover foxing (age discoloration) with darker edges. (3) Schiap, same as (2) but with tiny chip hole (missing paper) top left edge. 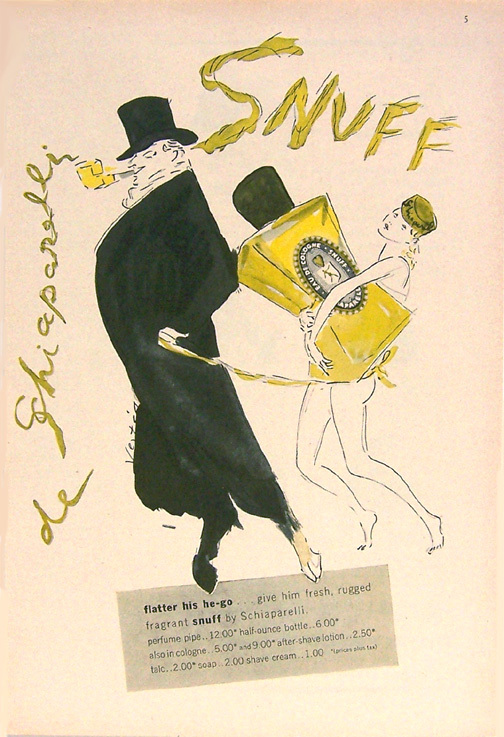 (1) Harper's Bazaar, March 1958 (entire page, including binding staple holes). (2) New Yorker, November 23, 1957 (entire page, no visible staple holes). (3) New Yorker, May 9, 1953. (1) 9 5/8" x 12 3/4"
(2) 8 1/4" x 11 1/2"
(3) 7 7/8" x 11 3/8" (bottom edge may have been trimmed). 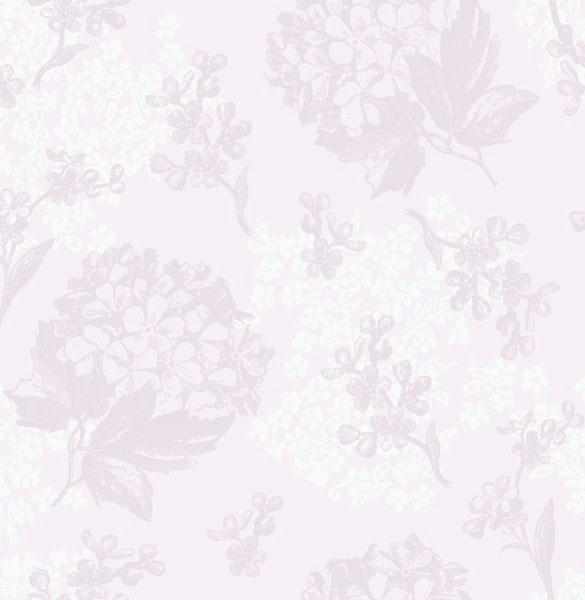 (1) Shocking, Perfume - 1/3 page, horizontal. 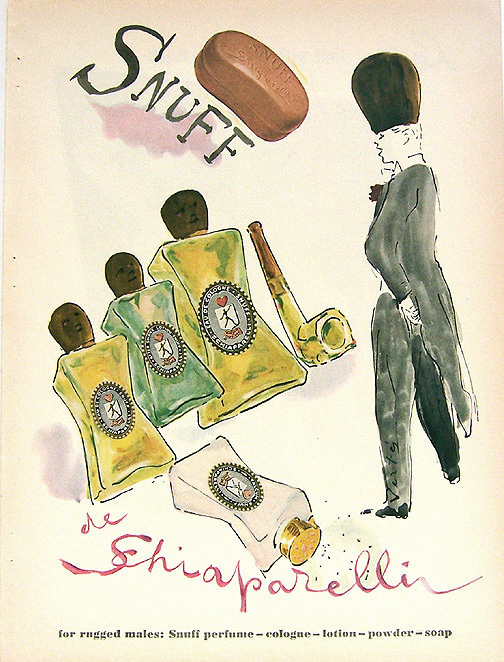 (2) Snuff, After Shave Lotion - 1/6 page. (3) Shocking, Cologne - 1/3 page, horizontal. (1) No tears, stains or folded corners. (2) No tears or stains; shallow fold top left edge - ready to fall off, allover foxing (age discoloration) with darker edges. (3) No stains or folded corners; 1/8 tear lower edge, slight allover foxing; very, very, slight center crease. (1) New Yorker, December 19, 1964 (entire page, visible staple holes on left). (2) New Yorker, November 3, 1956 (entire page, no visible staple holes). 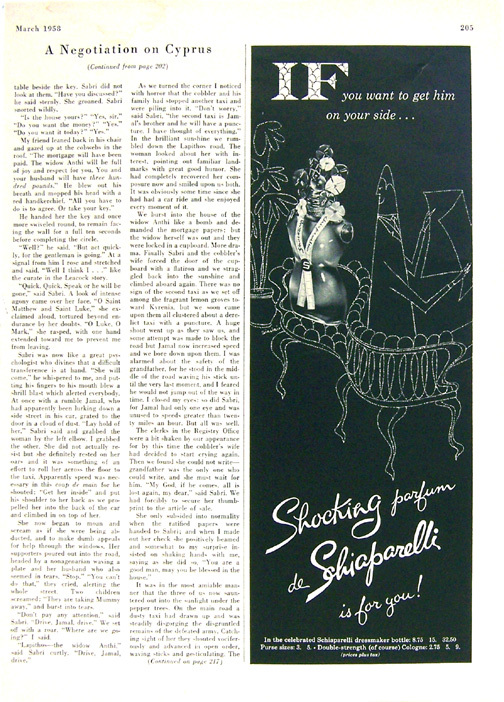 (3) New Yorker, (April or May) 1953 (entire page, no visible staple holes). 2/3 page, black and red. A hard-to-find ad. Condition: No stains or folded corners, 1/16" tear at bottom edge, teeny, tiny, fold lower left corner, all-over foxing (age discoloration) with darker edges. Photo of ad is darker (especially at the top) than it actually is. Page Size: 8 3/8" x 11 1/4" (entire page, including binding staple holes). Condition: No tears, creases or folded corners, stain on left edge between binding staple holes (glue residue) -- does not affect the graphics, slight rippling on left edge below top staple holes and on bottom left edge. Page Size: 8 1/2" x 11 1/4" (entire page, including binding staple holes). Condition: No tears, stains or folded corners, light center crease. Photo of ad is darker (especially at the top) than it actually is. Nice ad. Publication: New Yorker, June 4, 1949. Page Size: 8 3/8" x 11 5/8"